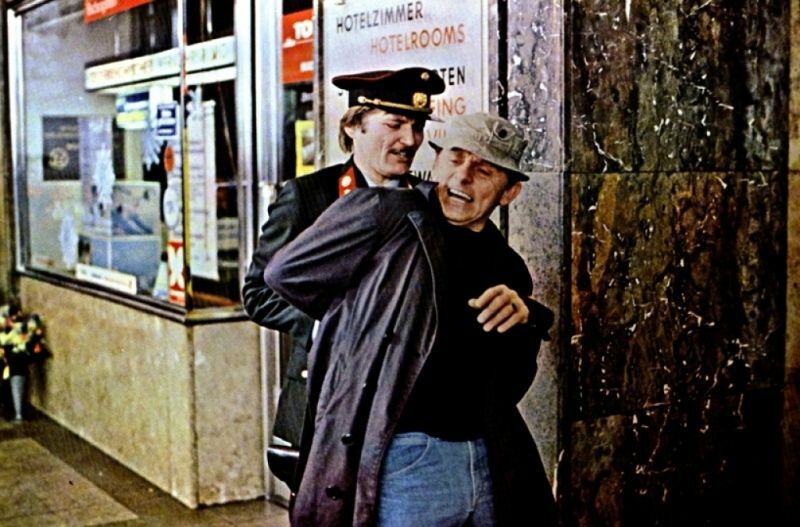 Imagine an unassuming policier directed by Rainer Werner Fassbinder and that will give you some idea of the atmosphere of Peter Patzak’s The Upper Crust (Den Tüchtigen gehört die Welt; literally, The Brave Own the World, 1981), an impressive and unjustly forgotten bilingual crime film. Although it appears never to have opened commercially in the United States, The Upper Crust screened in a retrospective of Austrian films at the now-defunct Carnegie Hall Cinema in May 1982, and returned to New York earlier this month as part of the Museum of Modern Art’s “Vienna Unveiled” series. Very much a product of the post-1968 hangover era, in which thoughts of revolution gave way to dispirited cynicism, The Upper Crust concerns a murky political conspiracy in which a trio of well-connected government officials (Ernst Konarek, Bibiane Zeller, and Fred Schaffer) turn to murder to suppress a potentially ruinous scandal. Although it’s not entirely clear (at least via the English subtitles) what kind of corporate crimes these starched-collar villains are up to, they are also connected to a prostitution ring via their pimp-enforcer Kralicek (Pavel Landovsky). When a small-time con man, Haumer (Lukas Resatarits), learns that Kralicek got his teenaged girl addicted to heroin and turned her out, he puts his unorthodox professional skills to work in a scheme to exact revenge on the whole group. Not wishing to sully their own hands, the trio send away to America for a mob-connected hit man to dispatch Haumer. 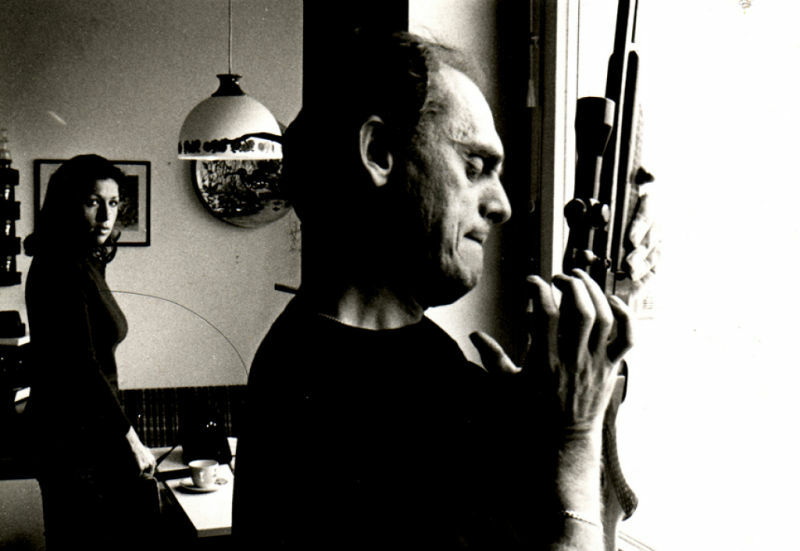 Although it isn’t quite their equal, Patzak’s film more closely resembles the political thrillers of Costa-Gavras or Wim Wenders’s The American Friend than the exuberant, violent Italian poliziotteschi that remain the most-exported Eurocrime genre of the period. Patzak’s palette is all muted browns and grays, and The Upper Crust takes place in an overcast, rain-soaked Vienna of modern metal buildings and post-industrial blandness—a far cry from Johann Strauss’s Austria. The look of the film is of a piece with the central performance by Franz Buchrieser, who plays the police detective assigned to the case with a thick mustache and a shrug. Smarter than his superiors, Major Kottan is also burned-out and all too aware that bureaucracy will derail any meaningful police work, especially as he follows the misdeeds up the chain to the “upper crust.” Kottan’s portly partner (Walter Davy, a World War II amputee) has only one leg—an inspired visual metaphor for the ineffectuality of the police. The Upper Crust was a spin-off of an acclaimed Austrian television series, Kottan ermittelt, which depicted police corruption and incompetence with a darkly humorous tone. The main character’s name is itself a gag, a pun on the Jerry Cotton series of films, and in The Upper Crust Buchrieser glares balefully at a couple of suspects who bust out the George Nader jokes. The show is unknown in the United States but sounds a lot like Hill Street Blues, which Kottan predates by five years. The chief element that distinguishes The Upper Crust from Kottan ermittelt is also the factor that should make the film ripe for an English-friendly home video release: the addition of American locations and actors to the mix. Patzak connected with Bay Area producer Richard Chase’s Baytide Films, in what Variety surmised was “the first true U.S.-Austrian co-production since World War II,” in order to shoot a prologue in some grungy San Francisco locations during the winter of 1980-81. (Primarily a director-producer of television commercials, Chase also worked as a journalist and a Dallas-based restaurateur before his early death at 46, in 1992.) Chase also recommended an American actor to play the villain: Frank Gorshin. Best remembered as Batman’s The Riddler, Gorshin made most of his living as an impressionist and a nightclub entertainer. 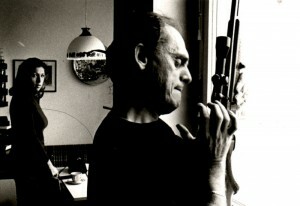 His career in front of the camera had sputtered after Batman; there were guest shots on crime shows like Ironside and Charlie’s Angels, but nothing more substantial, and Chase thought of him after reading one of many interviews in which Gorshin complained about the dearth of film roles on offer. The American non-release of The Upper Crust meant that nothing much changed for Gorshin - while promoting the film’s sole appearance in New York City, Gorshin noted that he was about to get killed off after four months on the daytime soap Edge of Night. It’s a bit of a tragedy, because Gorshin gives a first-rate performance—maybe the best of his life—in The Upper Crust. The prologue also features two other American actors: Broderick Crawford and stand-up comic Joey Forman, both of whom died not long after the film was made. Forman and Gorshin take Crawford to a sparsely-attended high school basketball game, buy him a couple of beers there, and then kill him during the drive back. They’re all connected to the mob, but Crawford’s character had been talking to the cops. As they leave the body in the passenger seat of a jeep parked under a freeway overpass, Gorshin puts the gun in Crawford’s hand. Forman jokes that a shot to the back of the head is not a very convincing suicide. Gorshin says that’s the most popular way to do it in Germany, then strains a muscle reaching around behind his neck to demonstrate. “Ow!” he exclaims with a sheepish grin, and . . . cut to the opening credits. The banal nature of this murder—a high school basketball game? !—sets the tone for Gorshin’s character, Harry Werner. He’s as at ease in his work as any paper-pusher who’s been working in the same cubicle for twenty years. Patzak shows him assembling his rifle (and adjusting a loose screw on the sight, which later seems to work itself loose every time he uses it; a nice detail), but spends just as much screen time on Harry’s progress in acquiring a rental car. Any macho posturing or moral agonizing would be out of place within this sketch of pragmatic evil. Gorshin gets that; he plays Harry with total nonchalance, his worn face usually devoid of expression but still captivatingly pregnant with uncertain intent. Every hired killer has to be a sociopath, one imagines, but Gorshin lifts the veil for only an occasional flash of menace. 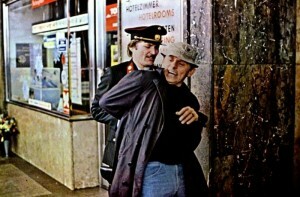 Near the end of the film, on the run from the cops and holed up in a lonely woman’s apartment, Harry kidnaps (catnaps?) his hostage’s beloved feline for leverage. The woman picks up a pan, then hesitates. Gorshin never looks at her; he’s busy stroking the cat. “What do you think?” Harry coos, addressing the pet. “Is she going to hit me with that pan?” It’s a satisfying irony that Gorshin, who became famous for mimicking a certain type of savagely ferocious actor (Richard Widmark, James Cagney, Kirk Douglas, Burt Lancaster) should understand that he could be even more mesmerizing by channelling the somnolence of Robert Mitchum. Gorshin’s only Riddler-esque indulgences in The Upper Crust are an occasional Nicholsonesque grin and the battered fisherman’s hat he keeps pushing down over his eyes. Both attract more attention than Harry might be expected to want, but it’s okay—they remind us that The Upper Crust is first and foremost a star turn. The film’s major flaw is its pulpy, at times nonsensical plotting, and the toughest part to swallow is Harry’s decision to stick around after the job is done—foolish behavior for a experienced lawbreaker. It’s as if Patzak couldn’t bear to let go of Gorshin, even at the expense of his story. Ultimately Harry sticks around until the end, becoming not so much the villain as a twinned, flawed protagonist, equal in stature and screen time to Buchrieser’s Kottan. The Upper Crust is Gorshin’s movie all the way. Every underutilized character actor should have one like it.